InIn late nineties I opened a new chapter – DIY electronics. To be honest, without any experience, previous skills (not counting cable soldering or simple repairs) or technical education. You may ask me – why ? There are so many great synthesizers and other modules on the market, what’s the reason to build them ? For solder smoke fans that’s not a question – nothing compares to the feeling when You complete an instrument and it works. But that’s the reason for a hobby. 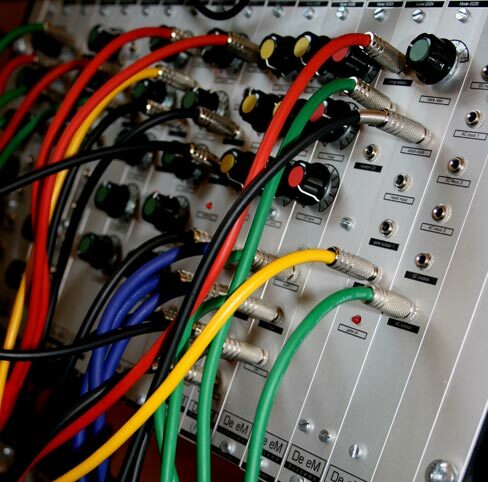 For electronic musicians hand made gear could be a valuable addition to their studio rig. Whatever You build yourself, it always sounds a bit (or completely) different than commercially available products. I also want to put attention on another aspect. Obviously a classical musician, for example violinist, should be able to tune his instrument, change strings etc. Same about electronic one – basic skills are necessary. So, what I’m going to tell You ? Not everyone should build custom electronics, that’s a choice – not an obligation. But if You want to, do not afraid of solder, reading schematics, long lists of parts etc. If I can, most of You can do it also. It’s a tedious task sometimes, but somehow… exciting. Hats off to all experts – definitely I’m not one of them. Check out LINKS page and visit their sites – there are serious killer synths on the net, which look (and maybe sound) better than commercial ones. Please do not expect any collection of schematics on my homepage (but some will be inserted anyway) – I’m not an engineer and I’m not able to design complex circuits (reprinting is not the purpose of my site). I can do the simplest jobs – only basic stuff, modifications of existing projects etc. All of my DIY instruments are sophisticated compilation of circuits found on the net, old and modern books, archive and vintage schematics. Sometimes updated and modified by me, to adopt modern parts or gain special features. However they’re not a core of my studio rig, I consider them as important members of analog family. Having some five or six working modules I decided to continue and fill the whole rack frame. Single frame. Which was faster than I expected. And with new modules left, I had no other option than another 3U frame… In March 2009 it was almost a synthesizer, but without oscillators, envelopes and VCA. Able to process and even produce sound. There is a Polish proverb – when You’ve said “a”, You should say “b” also. And I did it. I completed the final modules in October 2009 (third frame, 5U high). All’s well that ends well. 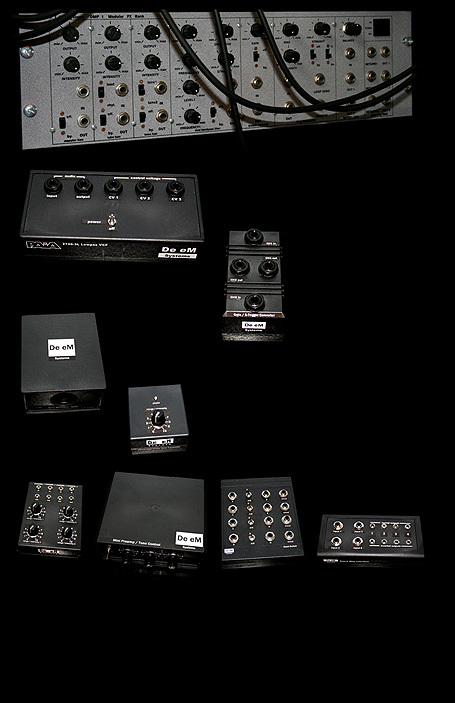 The whole system contains three cabinets (one 5U, so called Series 2000 and two 3U – Series 1000) and 37 modules. Some of them are modern clones of classic designs, most schematics have been found on the net or books. I’ve implemented some modifications and designed simple, auxiliary modules from scratch. Sometimes I’ve ordered printed circuit boards from designers (Papareil Synth Labs for example) or used modified kits. 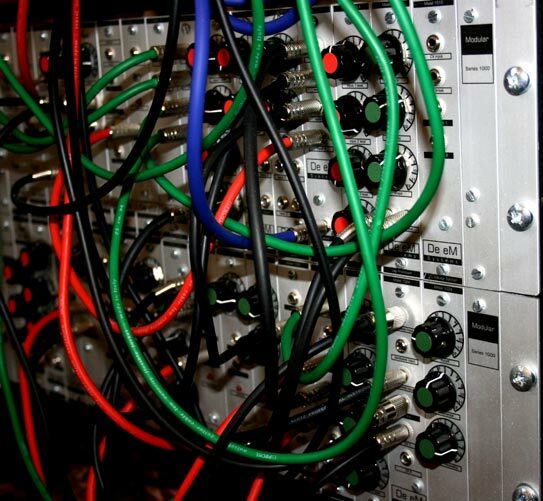 But the major part of the whole synthesizer is entirely built from scratch. And it works, which is a miracle to me… Certainly I’ve gained the most unpredictable, weird instrument of my collection. DMP 1 (labeled as CTR Systems product) was completed in late 1997. I had no experience then, but decided to try – at first two commercially available kits, then my own idea – modular FX bank, so called DMP 1 (short for Dariusz Mazurowski Project 1). Modules were based on circuits described in excellent Craig Anderton’s book Electronic Projects For Musicians (strongly recommended) – slightly modified and expanded. At the time of completion I was able to order professional, bulletproof panel with printed legends. Perhaps it’s still my best looking DIY instrument (if closely inspected…). The sound is not so good, but I wanted a lo-fi tool and I got it. PAiA 2720-3L Lowpass VCF is a modern replica of classic design from 70-ties. PAiA is a living DIY legend, still active. This filter was originally a part of modular synthesizer, sold as a kit. My replica pretty faithfully reproduce original circuit – very simple BTW. VCF has no resonance and is rather very raw, but quite interesting. Different and vintage, so I like it. Simple, dual channel Gate / S-trigger passive box converts standard gate signals (from analog sequencers for example) into switch triggers, accepted by some vintage synthesizers. But, in addition, it lets also trigger samples (or sampling procedure) on some older machines and switch on / off effects – if they have footswitch input. Korg Monotron noisy output and toy speaker inspired me to build something more robust, with better dynamic range, lower noise, but still the same lo-fi sound (and battery powered). The result ? This ugly MA-101, micro amp with speaker. FOTO-REZ is a voltage / gain controller, based on photoresistor – with range / intensity pot. Very simple circuit may generate or process voltage to gain modulation curves not available via keyboard or pot tweaking. And now for something completely different. Modification of commercially available instrument. In general, I don’t like to do it myself – that’s a job for specialists (as I’ve mentioned, I’m not one of them) – but in case of Korg Monotron the risk is rather low. It’s a simple, cheap, but also cool thing. Anyway, I’m not going to introduce You that instrument. Has some pros, like all analog signal path, ribbon as voltage source and modern clone of classic MS-20 / MS-10 filter circuit (however to my taste it doesn’t sound exactly like the original), but also serious cons – very noisy output and generally low dynamics (perhaps due to 3V battery supply). Still could be an interesting lo-fi tool, even if out of the box it’s rather a toy than the real deal. Lacks some important features – for example inputs for external control. 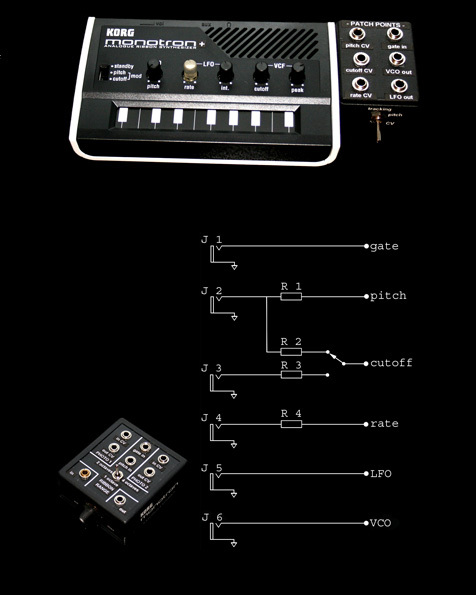 My project has been inspired by blogs devoted to Monotron (unbelievable number of such sites…) and custom mods. I’ve decided to turn this little thing into small modular synth, by adding a special expander – fixed to the right side of the instrument. Modification is easy, all You need is to find solder points on rear side of PCB, all clearly labeled. The circuit is very simple. Resistor values aren’t critical, in my case R 1 is 33K, R2 could be anything from 33K to 330 K (or a pot also), R3 and R4 are 10K. To control pitch response You may insert a pot or a trimmer. Perfect tuning wasn’t my goal, so this part was omitted during modification. Next step was another, this time external expander (connected via gate and CV inputs, BTW gate input is also an… output of ribbon voltage). This little box contains two voltage controllers based on photoresistors, general purpose gain control and switchable ribbon range option (1, 2 or 4 octaves).